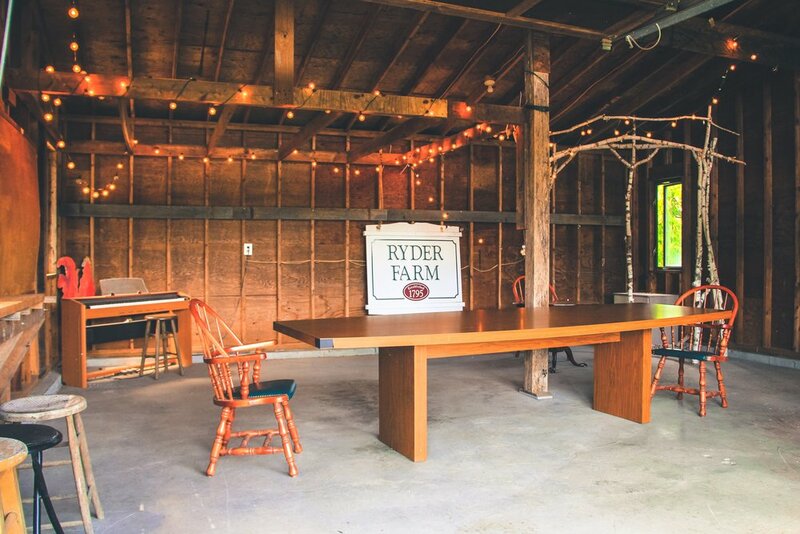 Ryder Farm’s landscape includes pasture, woodland, a half mile of lake frontage, natural amphitheaters, trails and numerous historical structures. This outdoor and indoor bounty provides a seemingly endless array of potential work spaces for residents. Below we have outlined the most significant of these workspaces. Each resident bedroom contains a writing desk with a chair. 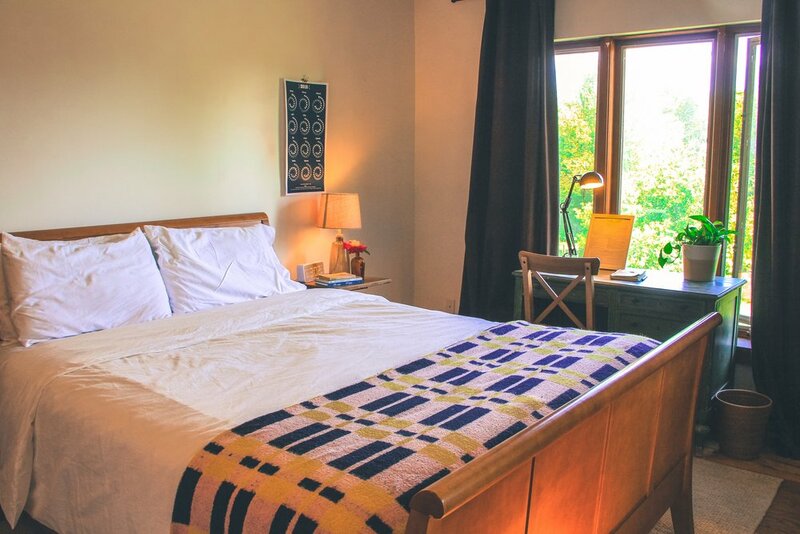 All rooms have access to Wifi and electricity. A bright, airy centrally-located room containing a table, armchairs, chaise and window seat. The library is also housed in this space and is available for use by residents. 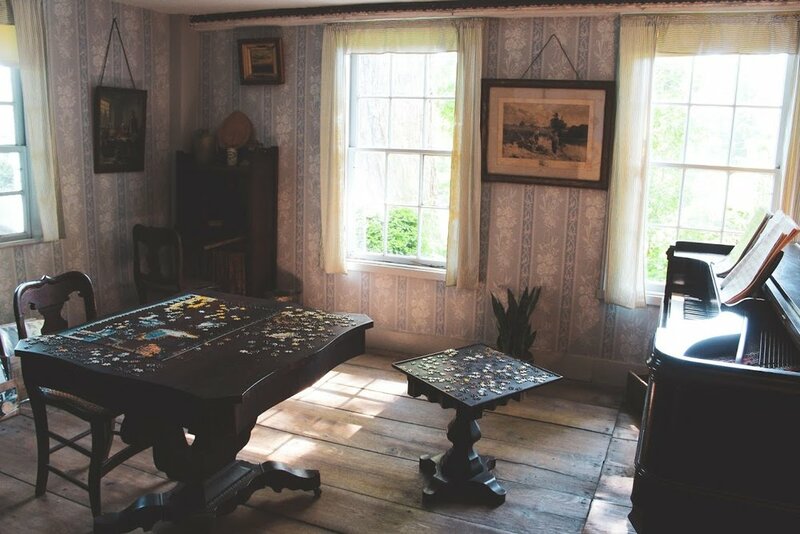 A slightly secluded sitting/music room with an antique piano, a small writing desk and a square table with four chairs available for resident use. 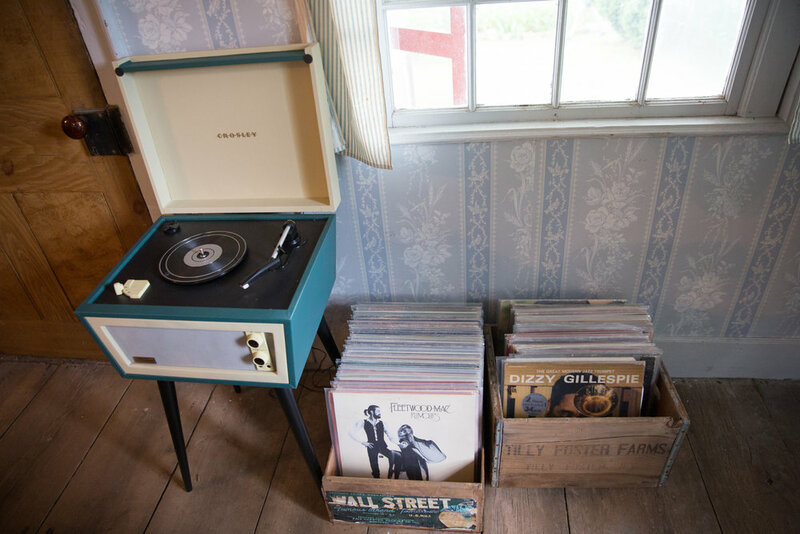 Located right off the Sycamores kitchen and dining room, the back porch houses wooden benches and tables for work overlooking the Nuptial Garden, Bowling Green and growing fields. This partially open-air space has two large tables and a bulletin board, which is perfect for larger group meetings. It also has a Casio Privia PX-800 keyboard. The Garage can comfortably fit twelve people. The open-concept first floor of Kay Hall includes a sitting area and dining room, and offers several distinct workspaces and areas for gathering. The first floor contains a couch, rocking chairs, a chaise lounge and two large dining tables with views of the pond and sheep pasture. Completed in 2017 thanks to a generous donation by Alec and Lee Seymour, the recently added Kay Hall deck overlooks the pond with a small table and chairs covered by an umbrella to keep away the sun. The deck is accessible from the first floor of Kay Hall, as well as the second floor bedrooms, each of which has its own balcony. Originally built by Will Ryder in 1910, the barn offers a large open area for groups or individuals looking for a large open space. 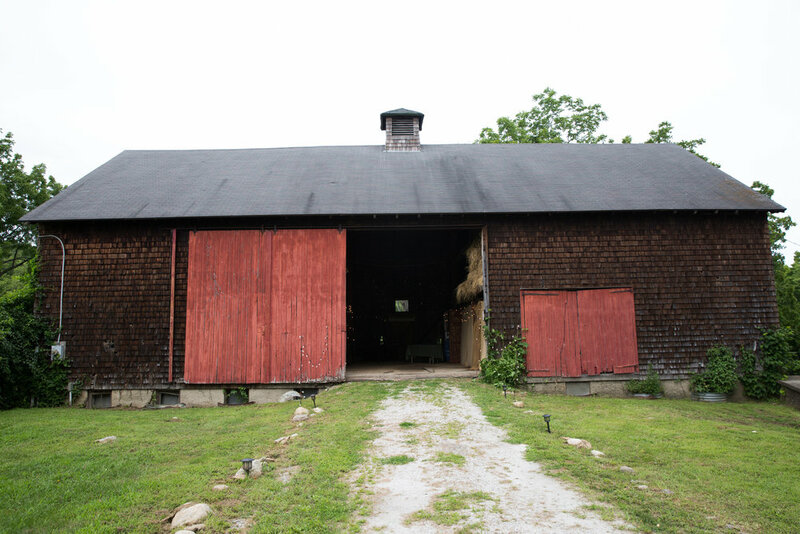 With a wooden stage donated by Rattlestick Playwrights Theater and numerous chairs and tables, the barn is easily configured to best serve a resident’s needs, and has been used in the past as a recording studio, rehearsal space for blocking and staged readings. The barn also has a well-maintained Weber upright piano. There is access to electricity and Wifi in this space. A large renovated chicken coop with windows and concrete floors. The space contains two desks and a Roland Juno-DS weighted keyboard. There is access to electricity but not Wifi. There is running water just outside the building. This covered round yurt on the edge of the pond allows residents to enjoy the natural beauty of the farm while still offering protection from the elements. The space has a table and chairs, and mosquito netting covers the sidewalls. There is no access to Wifi or electricity. 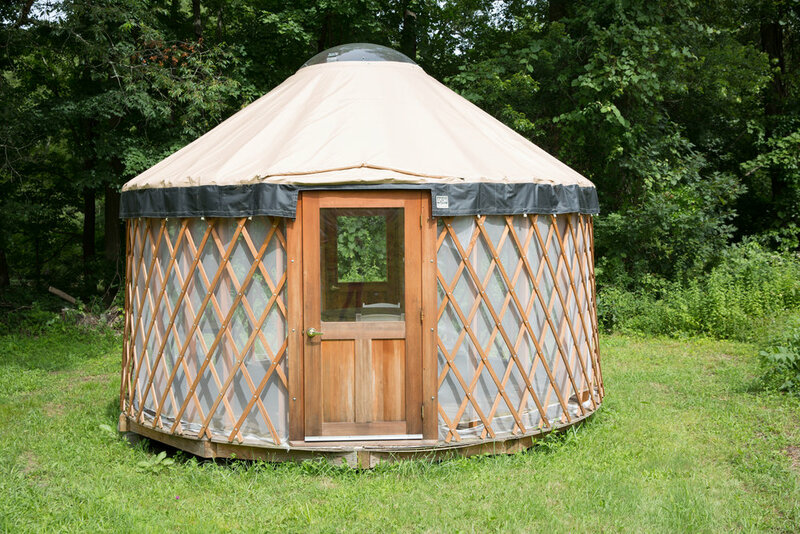 The Yurt can comfortably fit four people. An open-air structure directly adjacent to Ryder Farm’s growing fields, the gazebo is a little further away from the hustle and bustle of the main SPACE campus allowing a quiet place to concentrate and contemplate. The space houses a round table and chairs. There is no access to Wifi or electricity. The Gazebo can comfortably sit four people. The Bowling Green is a gently sloping open field with a concrete open-air stage at its end. Numerous lawn chairs and other furniture live on the green. The green is useful for exploration, the meeting of larger groups and leisure. Offering some of the most beautiful vistas on the farm, this floating dock, built by the SPACE team in 2012 allows for some peace and quiet far away from the main SPACE campus for a resident to dig into their work. Residents have even been known to take a boat out onto the lake to really clear their mind as they work. There is no access to Wifi or electricity at the lake. Photos by Dave Brown, Talya Chalef, Chioke Nassor, Stephen Sanders and Em Watson.